The idea that he had discovered evidence of ancient Europeans and Asians in the panhandle of Oklahoma was not unusual to Bill McGlone. He spent the better part of his life examining and researching the petroglyphs that were etched into the cliffs, peaks and caves all around his home in La Junta, Colorado. I first met Bill when I visited La Junta to explore the possibility that an Arabic language, now extinct for millennia, was mingled with the etchings and doodling of the Plains Indians. My first impression was that he looked like Burl Ives and had the gentle friendliness of Captain Kangaroo. He was too weak to rise from his chair and I was soon to learn that his health would not permit his guidance when we examined the petroglyphs. Bill was an engineer and a scientist. He quickly turned the misfortune of his illness into a more "empirical and objective" way for the ViewZone feature to be researched. Bill had drawn a detailed map of the entire region with landmarks and arrows pointing to a cliff and "Look here." Much of the passage was through cattle that were grazing in huge acreage that was bordered every mile by dirt streets numbering, "26, 25, 24...etc.," and, "G, H, I..." My little Geo Prism would have made a brilliant star in some Marlborough, macho commercial. But the map did its work and I finally located a remote part of the National Grasslands and followed the arrows to a narrow cave. Since Bill's discovery, the Park Service has been moved to protect the cave from vandalism. 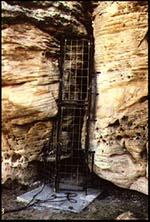 An iron cage has been erected to block the entrance and the cave can only be accessed with a key from the local Park Ranger. Luckily for us, Bill had secured the key in advance. We were able to enter the cave and set up our camera equipment to capture the anticipated spectacle. The area was boxed in by high canyons on three sides. There was a sandy river running through the central flat courtyard and the many petroglyphs were etched into the cliff walls, facing this courtyard. These can be viewed in a previously posted story about Picket Wire Canyon. In the midst of one of these cliff walls there was a crack about sixteen feet high and about two feet at the widest point. Once you squeezed through the narrow opening, the cave didn't open up much more. It's walls were smooth and ran almost parallel until they narrowed to a pile of rubble about thirty feet inside the cave. With all the markings on the cliffs surrounding it, this smooth rock was unblemished except for two unusual group of lines. The first was etched along a protrusion or bump on the otherwise linear wall. The other group of lines was located directly across from this bump. These lines were different from the Plains Indian markings and symbols. Bill McGlone has copied and studied these lines with the conclusion that they were, in fact, a written language called Ogam. 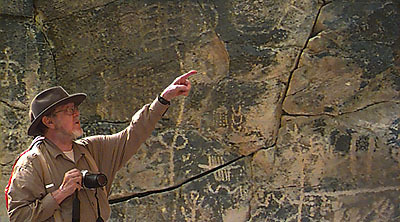 Bill explained that Celtics had a way of communicating with hand signs and that they often would write these signs to spell messages in rock or wood. A horizontal line was first drawn. Then vertical lines were arranged in groups, either above or below the line, or both. These vertical lines represented the position of the fingers, either raised or bent, or missing. By examining the group of lines in this cave, Bill had deciphered both messages, using old Celtic phonetics. Not only do the lines translate into old Celtic, but the translation is verified by the concurrence of the alignment with the sun. The first inscription read, "[We are the] People of the Sun." And the inscriptions on the bump, protruding from the flat wall read, "On the day of Bel, the sun will strike here." Ogam is the oldest form of writing in Ireland and Scotland. It can still be seen inscribed on hundreds of large and small stones, on the walls of some caves, but also on bone, ivory, bronze and silver objects. The Ogam script was especially well adapted for use on sticks. Sticks are part of the Basque word for "alphabet": agaka, agglutinated from aga-aka, aga (stick or pole) and akats (notch). The meaning of the word agaka therefore isn't so much "alphabet" as "writing", a stick with Ogam notches conveying a message. The name Ogam likely comes from oga-ama, ogasun (property, wealth) ama (Priestess, mother) property of the Priestess, which indicates that the script may originally have been designed for use by the clergy of the pre-Christian religion. Ogam may have originated in Libya, from where the first Gnostic missionaries are thought to have come. It was adopted and further developed by the first (Gnostic) monks in Ireland around 350 A.D. Our earliest information indicates that they were not sure as to where Ogam came from. According to the "Auraicept" the origin of Irish and Ogam must be sought in the Near East: "In Dacia it was invented, though others say it was in the Plain of Shinar" (line 1105-06). A "made in Ireland" version is recorded in "In Lebor Ogaim" in which the inventor is "Ogma mac Elathan who is said to have been skilled in speech and poetry and to have created the system as proof of his intellectual ability and with the intention that it should be the preserve of the learned, to the exclusion of rustics and fools" ( McManus 8.4). The script was used by the Gnostic monks as a monument script between 450 and 800 A.D. and the succeeding Roman Catholic Benedictines used it for literary purposes between ca 700 and 900 A.D. Every time the script was inscribed in stone it must have been used thousands of times on sticks, for which medium the script was obviously designed. Over 600 Ogam inscriptions are known from Ireland (collected by R.A.S. Macalister), some 40 from Scotland ( A. Jackson) and a growing number from the east coast of North America. The fact that not a single one had been successfully translated is not so much the fault of the monks who wrote the texts, as of our linguists, all of whom assumed that the language of the script was Gaelic. However, this assumption appears to be without foundation, because the syntax of he Gaelic language in no way lends itself to be written in traditional Ogam. Only on the Summer Equinox is the inscription illuminated by the rising sun in a way that suggests it was intentionally carved to mark this important day of the year. This would have been enough for most explorers but Bill was also a scientist. 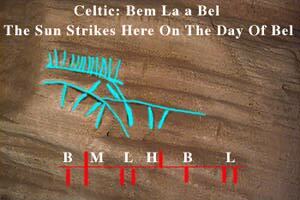 He discovered that the "day of Bel" -- or Balentine, was the Summer Equinox, on June 21st. Bill and some companions stakes out the cave many days prior to the Equinox and watched the sun's rays angle a shaft of morning light through the Eastern facing cave. The pattern was different every morning but there was no illumination of the bump. Then, on the morning of the Equinox, Bill and his friends witnessed and photographed the rays of light fully illuminating the inscription. This may not prove Bill's case though. The interior of the cave, although very old, is protected from the patina that usually forms on rock surfaces exposed to the elements and assists in determining age. If these are Ogam, they could have been placed here at any time by someone with the knowledge of Celtic. The face that there is little Native American inscriptions in the cave may suggest that either the cave was somehow blocked or that the symbols pre-dated the Indians and were respected as sacred. Of course, there are many other possibilities. It could be, as Bill conjectured, that explorers came up the Mississippi and followed the river system clear to the base of the Rocky Mountains. Perhaps they camped in the area for a while and then moved on. Or maybe they are buried somewhere in the canyon. ViewZone Magazine || --NEXT--(ogam translation program) || Comments?